High-alkaline cleaners feature high pH levels. Only solutions containing water can be measured for pH, according to Dawn Chemical Inc. The pH scale ranges from zero to 14. Solutions with a pH from zero to six are considered acids, with all solutions from eight to 14 considered alkaline. Solutions with a pH of seven are neutral. The higher the number on the pH scale, the more alkaline the solution becomes. Ammonia is a commonly used alkaline cleaner. High-alkaline cleaners efficiently remove organic soils, according to Auburn University. Organic soils are materials that once lived as animals or plants, including food, grease, oils, fat and lubricants. These materials do not contain carbon. The heavier the fat or protein content of the soil, the higher the need for a high-alkaline cleaner. High-alkaline cleaners work by reacting with the acids found in organic soils. High-alkaline cleaners dissolve fat, emulsify soil and destroy microorganisms. The acids in the soil react with the alkaline-based cleaner to neutralize and cleanse. Higher pH does not result in a higher cleaning ability but in the ability to neutralize stronger acid soils. High-alkaline cleaners include sodium carbonate, sodium hydroxide and ammonia. Sodium carbonate features a pH of 11 to 12. Also known as soda ash or washing soda, it is a widely used heavy-duty cleaner for manual cleaning, according to Auburn University. Laundry detergents often include sodium carbonate as a buffer to soften the water and prevent soap or detergent scum. Sodium hydroxide, also known as lye, has a pH of 13 to 14, making it one of the strongest high-alkaline cleaners available. It is often found in oven cleaners and drain-clearing solutions. Ammonia features a pH from 10 to 11. 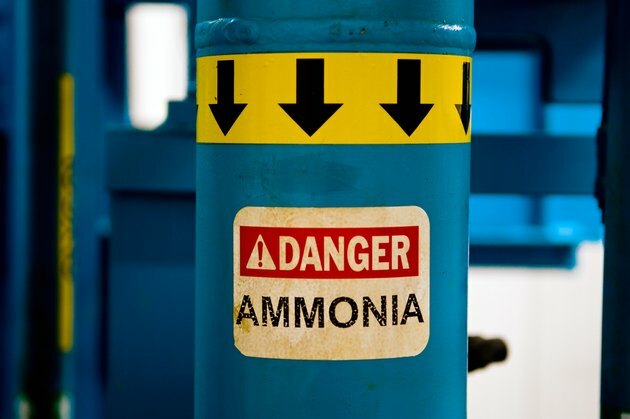 One of the most commonly produced chemicals in the United States, ammonia is found in many household and industrial cleaners. High-alkaline cleaners can be corrosive, causing damage in the form of chemical burns and damaged materials. Manufacturer label directions should be closely followed to prevent damage or injury. Most high-alkaline cleaners require well-ventilated areas and skin and eye protection. Products containing ammonia or lye should never be mixed with bleach, because the resulting chemical reaction produces poisonous chlorine gas. What Are the Most Acidic Substances in a Household?